Wood glue is a crafter and woodworker’s best friend. Many variations—including nontoxic varieties—exist, meaning it’s pretty easy to find the one that best suits your needs. Franklin International 1414 Titebond III Ultimate Wood Glue features a special proprietary waterproof formula that is ANSI/HPVA Type 1 water-resistance rated, making it extremely resistant not only to water, but atmospheric changes associated with humidity. Titebond III’s longer open assembly time allows for more detailed woodworking applications. Your project can be done at your pace, in your time. This means you won’t have to worry about it drying out before you complete a task. Lower application temperature is another key feature of Titebond III Ultimate Wood Glue; you can work outside in the cold, and it will still retain its original characteristics, allowing for easier work outdoors when you have less control over temperature variations. Titebond III is well-known for its strong initial tack. It’s also resistant to water, mildew and solvents, and holds strong regardless of what finish you use for your woodwork, making it a very versatile wood glue for a variety of woodworking tasks. One of the things that a lot of people don’t realize is that some wood glues are actually very toxic. But that’s not a problem with Titebond III. Not only is it nontoxic, but it it’s FDA-approved for indirect food contact, which means it’s safe to use on cutting boards and knife holders, among other things. This characteristic is also important to what makes Titebond III not only a good outdoor wood glue, but a great indoor wood glue as well. 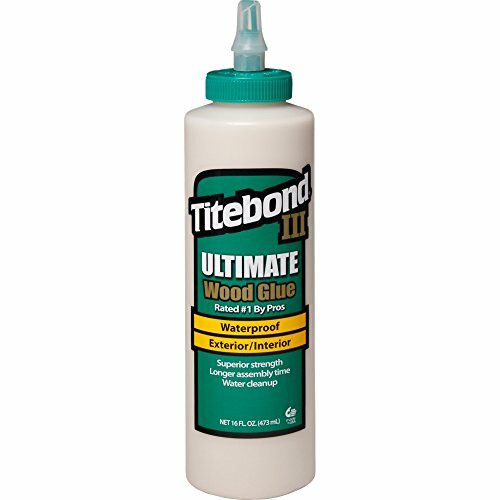 Titebond III dries with a bit of its tan coloring still visible; this won’t affect most woodworking applications, and it’s important to note it wipes away clean with water while wet. However, it’s important to note it does retain its coloring when dry. Gorilla Wood Glue is a PVA, water-based wood glue that provides superior strength thanks to its cross-linking bond formula. This means it’s suitable for any woodworking application, even larger, heavy-duty outdoor applications. Wood glues take longer to dry than their cousins of other glue types, but Gorilla is well-liked for its relatively fast-drying wood glue. Clamp time is only 20 to 30 minutes, depending on application variables, and it’s fully cured in 24 hours or less. This makes Gorilla Wood Glue ideal for projects with a quick deadline. Gorilla Wood Glue is not only ideal for indoors, but is very suitable for outdoor use as well due its water-resistance. It boasts an ANSI/HPVA Type II water-resistance rating, a guarantee of superior water-resistant action. One of the great things about Gorilla Wood Glue is it’s suitable for just about any wood type you can imagine. Not only is it great for softwoods, but it’s also very suitable for hardwood and even natural wood composites. 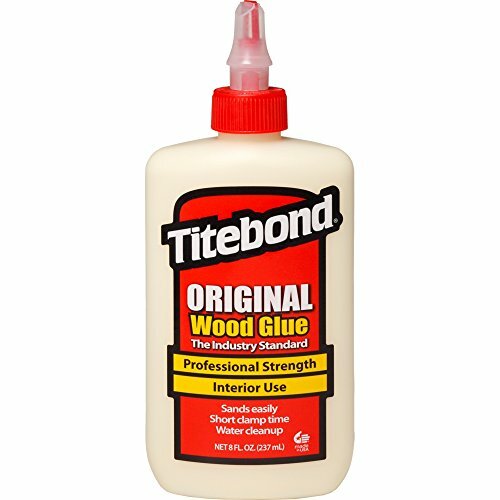 If you’re a beginning woodworker or crafter, this glue will take the guesswork out of wood compatibility. Gorilla Wood Glue is designed to be safe for indirect food contact, per the FDA’s indirect food contact standards. While it’s not suitable for direct food contact, it’s designed to be safe for things like kitchen equipment that doesn’t directly touch food, like spice racks and the like. Like a lot of other high-quality wood glues, Gorilla Wood Glue dries to what the manufacturer calls a “natural” finish; this means that it won’t be completely invisible when dry. That said, this will not affect most woodworking applications, but is important to note. 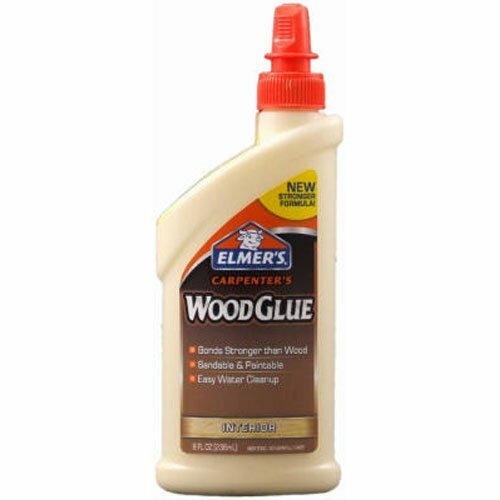 Elmer’s E7010 Carpenter’s Wood Glue is nontoxic, which means you don’t need any gloves or protective face or eye coverings to use it. It’s also fume-free, making it a better choice for those with sensitivities to smell. Elmer’s E7010 is designed to be stronger than wood for superior tacking and staying power. If you make a mess, simply wipe the glue away with water while it’s still wet for easy water cleanup. Elmer’s E7010 is ideal for hobbyists, because it’s easily standable and paintable, allowing you to get creative with your woodworking for a variety of applications. It’s not designed with a high waterproof rating, so it’d be best to opt for a different glue for any projects that may be subjected to a lot of water. Dries to a natural finish; not a con, but worth a note. The biggest feature of Titebond Original Wood Glue is easily its versatility. Not only is it ideal for wood, but it can be used on leather, cloth and other common crafting and woodworking materials. Titebond Original is nontoxic and free of solvents, making it a friendlier choice around the house. Cleaning up stray glue is easy; simply wipe away wet glue with water. Titebond original is an aliphatic-resin glue that’s been trusted for over 50 years due to its strong tack and long-lasting hold. Like most wood glues, this will not dry clear; it features a natural/tan finish. 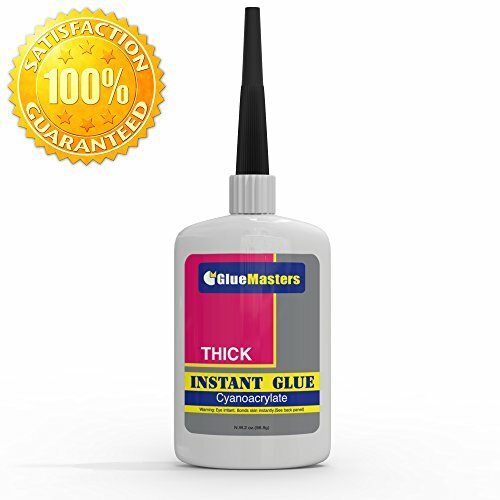 Glue Masters’ Professional Grade Cyanoacrylate comes in varying viscosities; the thick viscosity formula provides an easy and highly-manageable gluing experience. When speed is important, Professional Grade CA settles in 50 seconds or less. Glue Masters’ CA works great not only on wood, but puzzle pieces, china, glass and more. Versatile: Suitable for wood, glass, china, etc. Cyanoacrylate has a shorter shelf life than other glues; expires about a year after opening. Cyanoacrylate is toxic; don’t use near food, children or pets. Causes severe chemical burns when coming into contact with cotton and some other natural fibers; always read cyanoacrylate instructions carefully before using. When it comes to the ultimate wood glue, you can’t beat Franklin International 1414 Titebond III Ultimate Wood Glue, making it the winner of our wood glue roundup for superior strength, waterproofing, nontoxicity, and ease of use.